Yoga was on tap for today, but I decided to defer it until later in the week to benefit my tennis schedule. Besides, I felt like sweating my way through Max Interval Circuit would help purge the achiness of yesterday’s Back & Biceps routine. It did. 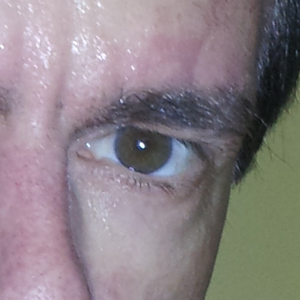 To the left is a self-portrait taken immediately after completing the Circuit. Even though I slowed it down to better monitor my knee, I was still a sweaty shell of my former imagined self when done. This week I’ve got two singles matches scheduled back to back (that is, two days in a row). It should be a good test to find out how much I can get away with. I think I would like to get Yoga in on one of those days and then impose a rest day on the other. Last year, during my first round, I was obsessively doing my daily P90X routine and playing tennis on the same day. Over time, I think I’ve come to the conclusion that for me, at my age, that’s just too much. It becomes counter-productive and actually increases the chance I’ll get injured, which is contrary to my entire objective of working out in the first place. This entry was posted in P90X-Insanity Hybrid, Round 4 and tagged Calories, Heart Rate, knee, Max Interval Circuit, P90X-Insanity Hybrid. Bookmark the permalink.